Flat Earth Theatre Presents McDonagh's "The Pillowman"
Art and authority come head-to-head as Flat Earth Theatre stages its final production of the 2012 season, "The Pillowman," from August 10 - 18 at The Factory Theatre in Boston’s historic South End. 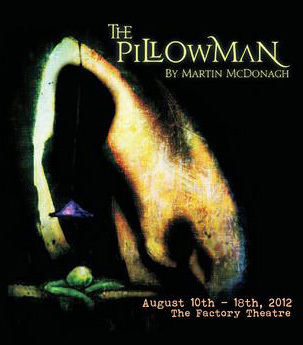 Written by noted Irish playwright Martin McDonagh, "The Pillowman" examines the complex relationship between the artist and the state, and ponders the culpability for acts inspired by works of art. In the confines of an interrogation room in a totalitarian regime, writer Katurian bears his responsibility to storytelling under the threat of pain and sacrifice. A resemblance between his most violent modern fairy tales -- those depicting mutilation and murder of children -- and several horrific crimes under investigation, casts suspicion on Katurian and his childlike brother Michal. With the police prepared to go to any lengths to solve the current attacks, the brothers are forced to relive the traumatic events of their upbringing through the lens of Katurian’s writings. The company includes Cameron Beaty Gosselin, Chris Chiampa, Juliet Bowler and James Bocock. Director Sarah Gazdowicz embarks on a bold new examination of McDonagh’s work, employing multimedia techniques to explore this dark meditation on the opposing roles of artist and authority. She is joined by puppet masterMatthew Woellert, whose visual storytelling illuminates the human core of the unflinching black comedy and gives life to Katurian's microcosmic stories of abuse and imagination. Martin McDonagh is best known as the writer and director of the acclaimed film "In Bruges," and has authored several noteworthy plays including "A Beheading in Spokane," "The Lieutenant of Inishmore," "The Lonesome West" and the Tony Award–winning black comedy, "The Beauty Queen of Leenane." "The Pillowman" was awarded the Laurence Olivier Award for Best New Play in 2004, and received a 2005 Tony Award nomination for Best Play. For tickets and information, call 1-800-838 - 3006 or visit flatearththeatre.com.